Innovation Network Your browser is ancient! This site is not intended for display in out-of-date browsers. To access the site, please upgrade to a different browser. We work on a variety of projects that fall primarily in these areas: Advocacy & Social Movements, Health & Health Equity, Social Justice, Theory of Change & Evaluation Planning, Evaluation Capacity Building, and Dataviz. Innovation Network is made possible through the hard work and dedication of our staff and board of directors. Please feel free to contact us by phone or email. We provide knowledge and expertise to help social sector organizations learn from their work to improve their results. Let us know how we can help you. Measure Results. Make Informed Decisions. Create Lasting Change. We are an established leader in advocacy evaluation, and have a demonstrated ability to design and implement evaluations of complex initiatives, including grassroots movements, systems change, and policy advocacy. We develop customized tools and frameworks to more effectively evaluate health and health equity initiatives, and to learn how advocacy efforts affect health policy and people’s health. We focus on social justice values and issues such as racial equity, immigration reform, health and health equity, and economic justice through many of the initiatives that Innovation Network evaluates. We develop theories of change and evaluation plans to align strategies, activities, outcomes, long-term goals, and measurement approaches. We provide tailored evaluation training, coaching, and technical assistance to funders and nonprofits on evaluation topics such as the fundamentals of evaluation, logic models and theories of change, and advocacy evaluation. Our staff are skilled in effective data visualization techniques, or “dataviz,” and we can help your organization in maximizing the communication power of data and findings to make the most impact on your audiences. 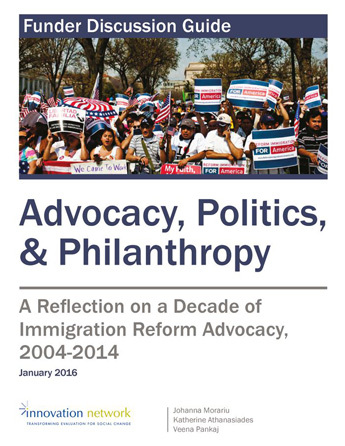 Advocacy, politics & philanthropy: A reflection on a decade of immigration reform advocacy, 2004-2014. 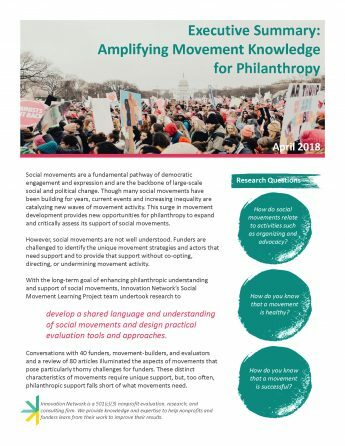 Funder discussion guide. 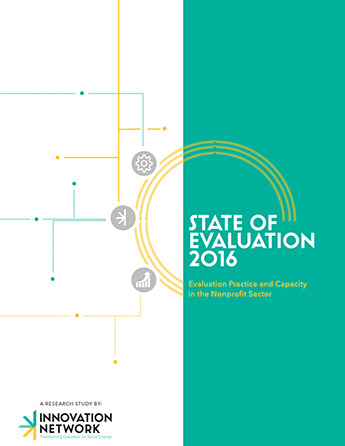 State of Evaluation Evaluation practice and capacity in the nonprofit sector. PointK Transforming knowledge into change. With deep experience in the evaluation, nonprofit, and philanthropic sectors, our staff is dedicated to sharing insights and tools that help our clients improve their work. © 2019 Innovation Network. All Rights Reserved.